Stocks sold off on Tuesday’s holiday-shortened trading session and the market was closed on Wednesday to recognize the Fourth of July. Pre-market action is showing a bounce, but it’s not clear if it will hold yet. With that in mind, here are our top stock trades for Thursday. It’s no surprise to InvestorPlace readers, but Micron (NASDAQ:MU) reported another great earnings report and saw its stock decline afterwards. 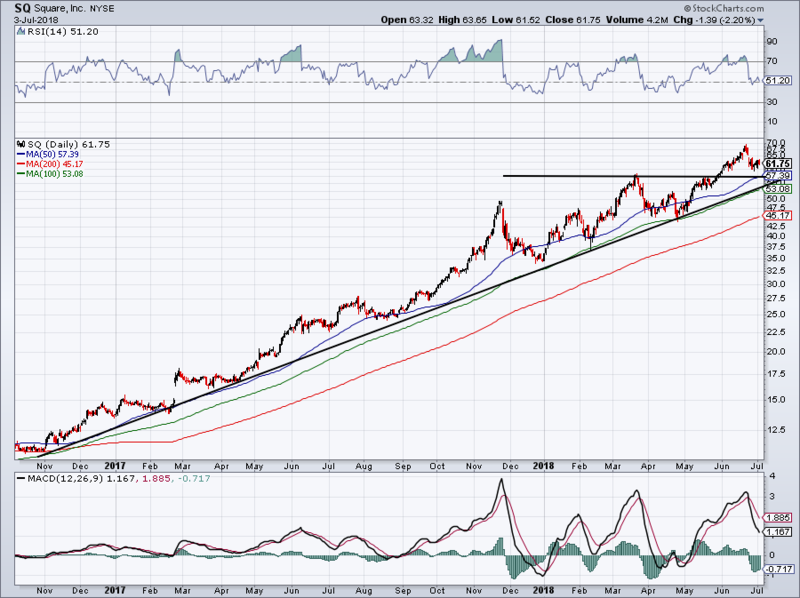 Now $13-per-share off its $64 high and Micron is nearing support. It bounced off $50 (its November high) before hitting trend-line support (blue line) near $51. Despite MU’s volatility, this trend-line has been pretty telling. Should it fail, Micron could test its 200-day moving average for the first time in more than a year. Should that mark fail as support, $46 would be the next line in the sand. Aggressive bulls can take a partial shot on MU near current levels, with a plan to add to the position at the 200-day. A stop can be used if MU closes below $46. 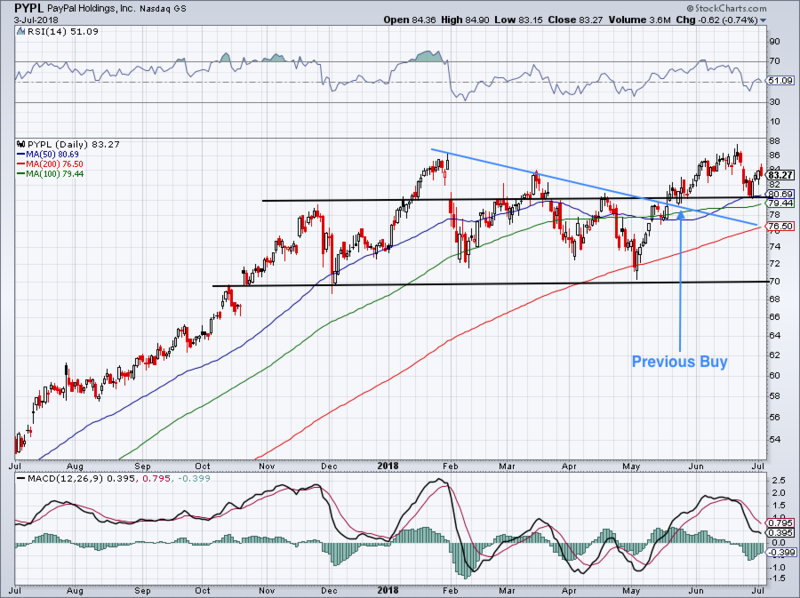 The trend in Square (NYSE:SQ) is truly a thing of beauty. Eventually the rally will end, but not until this level gives way. 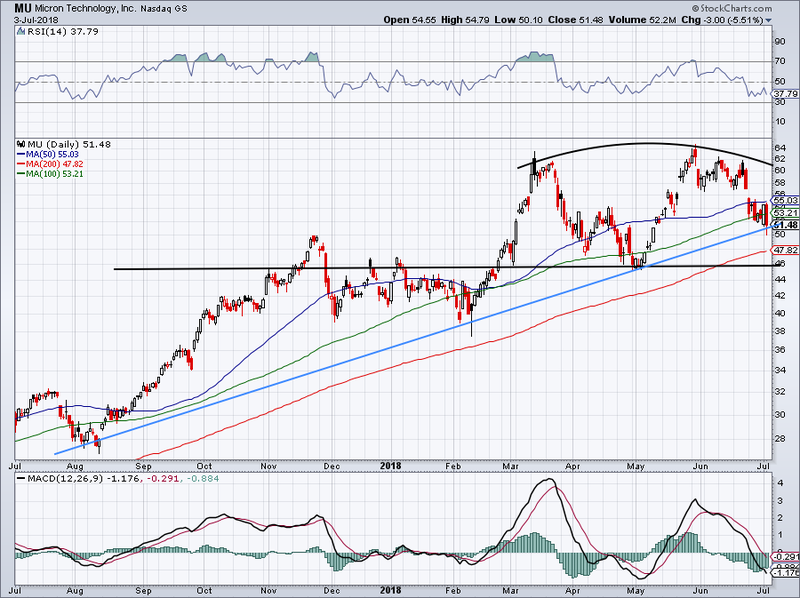 The trade in Square is really simple: the $57.50 level should act as support, and happens to come in near the 50-day moving average. The $53 to $54 level is where trend-line support comes into play and is near the 100-day moving average. Aggressive bulls can buy at the 50-day and 100-day. Conservative bulls can buy at the 100-day. I wouldn’t short SQ unless trend-line support fails, and even then, it doesn’t feel worth the risk. Just as a heads up, the trader who took a massive long position via call options is still long. JPMorgan Chase (NYSE:JPM) is looking attractive after its big dividend boost and Bank of America (NYSE:BAC) still looks attractive with its low valuation and big earnings growth. At less than 10 times this year’s earnings, Goldman Sachs (NYSE:GS) isn’t exactly unattractive. But its charts show a struggle. After topping out at $275 in March, GS stock has painfully slid more than $50 down to $220. Shares remain in a downward channel that, until broken, will continue to keep the Goldman bulls at bay. 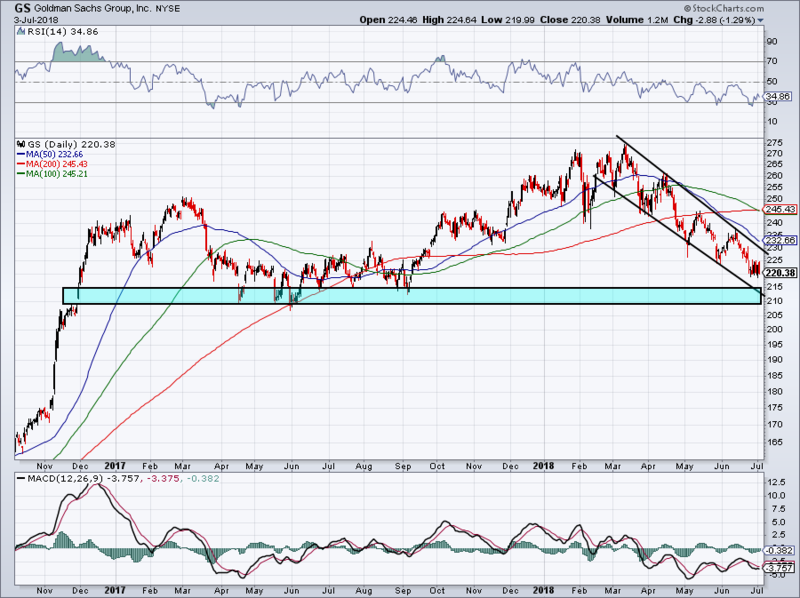 While GS has been consolidating nicely near $220, stronger support sits down near $210 to $215. If it gets there, bulls could justify dipping their toe in the water. We were previous bulls on PayPal (NASDAQ:PYPL) on its breakout retest. Since then, we’ve seen PYPL rally to $87 and fall back to $80. At $80, it found support. Given that this level was previous resistance, it’s hardly surprising. However, the move is a positive sign for the slow-and-steady bull camp. Investors can stay long PYPL and look for an eventual retest of its highs. If the $80 level gives way, use caution. More conservative bulls can wait for a potential retest of the $80 to $81 area before buying. 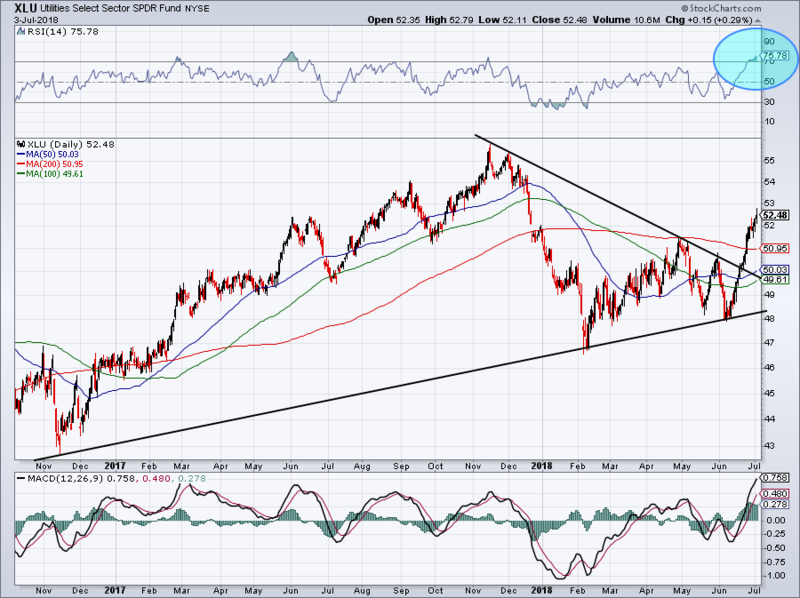 The Utilities SPDR (ETF) (NYSEARCA:XLU) is in breakout mode. Last month, we noted the strength in REIT stocks despite the Federal Reserve raising interest rates. That’s been true for utility stocks as well. Despite the breakout over downtrend resistance, the ETF is becoming overbought. It sports a 76 on the RSI (blue circle), suggesting that now may not be the best time to buy. While a retest of downtrend resistance may not be in the cards, a pullback into the $50 to $51 area would be nice, along with some consolidation. That will allow the XLU to work off its overbought condition and recharge before its push to previous highs near $55. Article printed from InvestorPlace Media, https://investorplace.com/2018/07/5-top-stock-trades-for-thursday-mu-sq-gs-pypl-xlu/.